Two University of Colorado at Boulder physicists are part of a collaborative team working with the U.S. Department of Energy's Brookhaven National Laboratory in New York that have created the hottest temperature matter ever measured in the universe -- 7.2 trillion degrees Fahrenheit. 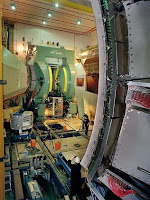 The team used Brookhaven's giant atom smasher, the Relativistic Heavy Ion Collider, or RHIC, to ram charged gold particles into each other billions of times, creating a "quark-gluon plasma" with a temperature hotter than anything known in the universe, even supernova explosions. The experiment is recreating the conditions of the universe a few microseconds after the Big Bang. CU-Boulder physics department Professors Jamie Nagle and Edward Kinney are collaborators on the Pioneering High Energy Nuclear Interaction eXperiment, or PHENIX, one of four large detectors that helps physicists analyze the particle collisions using RHIC. PHENIX, which weighs 4,000 tons and has a dozen detector subsystems, sports three large steel magnets that produce high magnetic fields to bend charged particles along curved paths. RHIC is the only machine in the world capable of colliding so called "heavy ions" -- atoms that have had their outer cloud of electrons stripped away. The research team used gold, one of the heaviest elements, for the experiment. The gold atoms were sent flying in opposite directions in RHIC, a 2.4-mile underground loop located in Upton, New York. The collisions melted protons and neutrons and liberated subatomic particles known as quarks and gluons. "It is very exciting that scientists at the University of Colorado are world leaders in laboratory studies of both the coldest atomic matter and now the hottest nuclear matter in the universe," said Nagle, deputy spokesperson for the 500-person PHENIX team. In 1995 CU-Boulder Distinguished Professor Carl Wieman and Adjoint Professor Eric Cornell of the physics department led a team of physicists that created the world's first Bose-Einstein condensate -- a new form of matter. Both Wieman and Cornell are fellows of JILA, a joint institute of CU-Boulder and the National Institute of Standards and Technology where Cornell also is a fellow. The physicists, who shared the Nobel Prize in physics for their work in 2001, achieved the lowest temperature ever recorded at the time by cooling rubidium atoms to less that 170 billionths of a degree above absolute zero, causing individual atoms to form a "superatom" that behaved as a single entity. The new experiments with RHIC produced a temperature 250,000 times hotter than the sun's interior. The collisions created miniscule bubbles heated to temperatures 40 times hotter than the interior of supernova. By studying the "soup" of subatomic particles created by the RHIC, researchers hope to gain insight into what occurred in the first microseconds after the Big Bang some 13.7 billion years ago, said Kinney. Later this year physicists that include a team from CU-Boulder hope to use the Large Hadron Collider in Switzerland to ram ions together to create even hotter temperatures to replicate even earlier conditions following the Big Bang.